We've been rumor-milling all day about Johnny Depp and Vanessa Paradis' possible split, and while we're not in a place to confirm or deny, we can't help but wonder if the look he's been rocking for his latest Dark Shadows role was enough to creep out even the hottest of goth chicks. Of all the wild styles he's pulled off, this one seriously might take the ugly cake (and we're even counting this blue nail art). Remember when you thought Elijah Wood’s radioactive eyes were stealing your soul in those Alice in Wonderland posters, but at second (and third) glance you realized it was just Johnny looking exceptionally horrific as the Mad Hatter? Well, yup, we’re back there again. 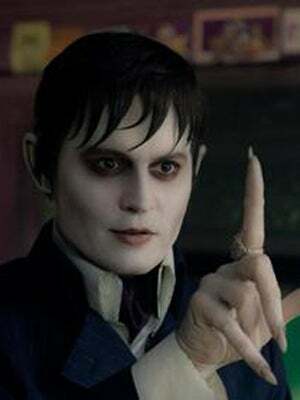 Still, we can't wait to see JD as the brooding Barnabas Collins in Tim Burton’s much-anticipated resurrection of '70s (and '90s) occult cheesy classic (in theaters May 11). We’re dying to see if third time's a charm for Barney and friends, and have our fingers firmly crossed that he and Vanessa work it out now that he's out of that hideous hair, makeup, and nails!